So my infatuation with winter neutrals continues with this outfit of black and white layers. I wore this last week in London and it was so cold I didn’t actually overheat on several very crowded tube rides – being a comfortable temperature on the Underground at any time (summer or winter) is a bit of a miracle. I’ve shown the outfit both with and without the oversized blanket scarf (sadly sold out but I do love this one by River Island) as I loved it both ways. It was everything I wanted from a winter outfit: comfy, warm and smart. A white coat may not be the most practical choice for travelling on public transport, but I only got a couple of smudges on one sleeve (they came out) so I think I did pretty well! 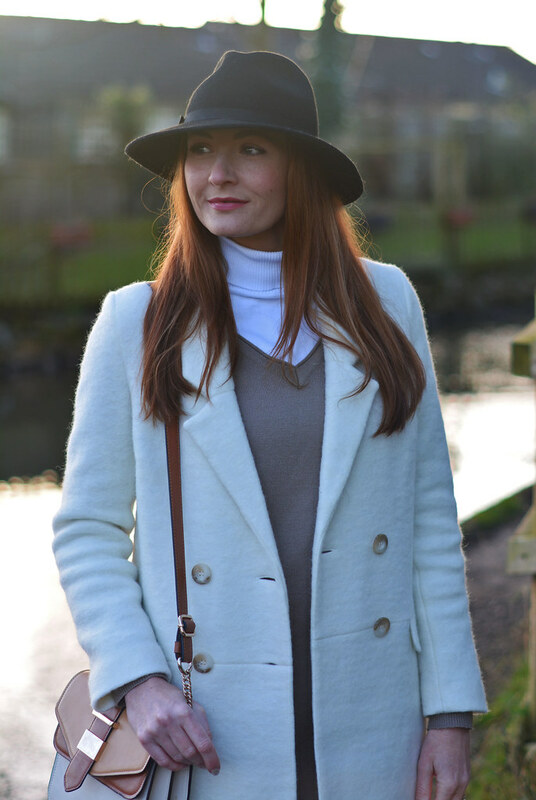 This encompasses so many pieces I love wearing in the winter right now: riding boots, a smart coat, white roll neck, a black fedora. What are your favourite pieces? And how practical are they…?! Do share in the comments! P.S. Don’t miss any of my posts by signing up to my fortnightly newsletter! I love your wihte-camel colour combination! You look very stylish. Well done! Gorgeous layering. I am horrible at keeping anything white clean, it seems to attract dirt as soon as I put it on. This coat is such a great classic cut that you will be wearing it for years to come. I love an easy and chic style like this! White coat and black hat, very chick. I like this outfit. Thank you Anna, so glad you do! Thanks sweetie, I'll be looking out for you in a white coat…! You are right, it is such a happy and elegant colour. Looking very good my dear. Love everything. I once had a white coat and it made my dry cleaner very happy. My favourite things are my silver shoes, my golden boots and my skinny jeans. Mariosa that's so nice of you, thank you!! The white coat is absolutely stunning and I love it with the black riding boots. Kudos to you for only getting a few smudges on it! I do love this white coat…and the overall pastel look. So soft. I also just read your earlier post on "great links"…and then clicked on and read the link to the blog post on "blog commenting"…and then read your comment on that post about gravatar.com. Thanks so much for that idea, Catherine. As well as the many other ideas that I've read on your blog that have been helpful to me as a fairly novice blogger. Much appreciated! We were suppose to visit my sister and her husband in the UK next month but she advised us to cancel as apparently it is too cold to do anything. So we might go in April instead. Anyway, coming from the UK you must be an expert in cold weather dressing and yet you still managed to look chic and well put together! Thanks Catherine for answering that soon and for the info. No problem at all, Ana! I'm still amazed at how it happened. And thank you, that's really sweet of you to say! Very chic coat chick, love the look. My essentials have been OTK boots, fedora and faux fur!! Love the white coat, if I could only pull it off with kids. I'm gasping over the photos! I just love cold weather photos, you get such a nice rosy tint. Only smudges on one sleeve? I'm impressed! I think I'd be very careful where I sat while wearing a White coat. Awww JJ you're so sweet, thank you so much. We were really pleased with how pretty the light was when we did this! Wow not overheating on the tube, I didn't realise that was even a possibility! Haha 🙂 I love this look Catherine, your scarf is perfect and the lighting in these photos is beautiful. I know, right? I was was amazed that I (literally) kept my cool! Thanks Daniella, I love the light here too… gotta love that golden hour! You are stunning in these photos Catherine. I just want to have a little tour and be told all about the location. It's precious right?! Where is it? Catherine, it's my Friday night, and I've had a glass of wine (or two), and I just have to tell you: you're so pretty. Really. You're really pretty. Big hug to you. So hope I meet you in person one day! Love this whole look. It's funny because the Kaliko coat you linked to, I bought last week and it's fabulous. I've ordered some flat boots today and I already have the fedora. You can't been classics. Love this look on you! It's different to your usual colour on colour but suits you all the same, naturally. Great classic look! You look wonderful. Love the off white coat. I am a fan of neutrals and this is a classic look. Love the hat on you too. Hi Catherine I liked the whole outfit question do those kind of coats are good for a freezing temperature because here in NY we have to wear a down coat to go out. Thank you, Ana! It depends on whether you literally mean freezing i.e. 0C or 32F – in which case yes, as long as you layer underneath like I did! It was about 3 or 4 degrees above freezing that day, and I had an extra two layers underneath the white roll neck. I also wear gloves AND mittens, plus the big scarf wrapped round me. You loook great in that hat! Love the coat..beautiful!! That's sweet of you Raquel – thank you! Don't think I could do the white coat. As much as I love it, I'm the kind of person who would have dropped red wine down this before I even got it off the hanger!! Thanks, Katy! I spent the day in a really chilly venue that was actually a church vault, so the blanket was draped over me for the day and really helped keep me warm. And yes!! 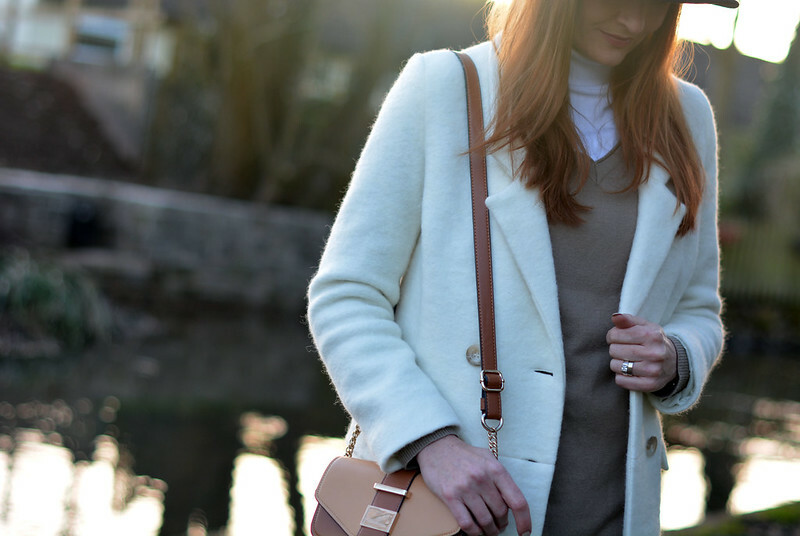 to camel coats – is there anything better this season?!! hehe it was the crypt I mean, not the vault… though I'm not sure if there's a difference? !